Medical workers are in pain. Lifting-related injuries aren’t limited to manufacturing or other labor-intensive industries. The number of musculoskeletal injuries from overexertion in health care occupations rank among the highest of all U.S. industries, according to The National Institute for Occupational Health and Safety. 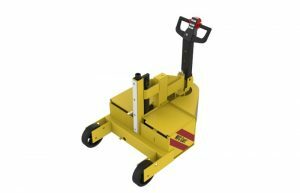 The company’s MFC-100 cart can transport cylinders and drums up to 800 pounds. 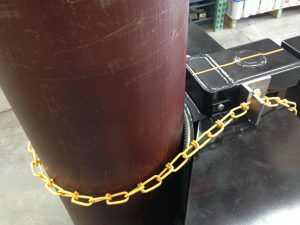 Typically, workers must manually move cylinders onto a dolly, or in some cases, they’ll roll, or shimmy, the cylinders to the intended location, says Ryan Blesi, vice president of material handling and a design engineer at Power Pusher. Other key safety features include an ergonomically designed handle with hand guards and a variable-speed throttle. 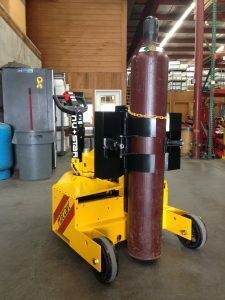 All of the control operations are located on the handle so users don’t have to bend or exert additional effort to operate the machine, Blesi says. It’s also a walk-behind unit so there is line of sight so you’re not blocked by anything. “We customize 80 to 90% of the products that leave our facility, so we’re very involved with our customers and their specific needs,” he says. 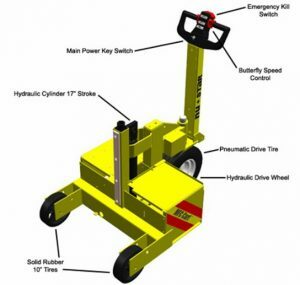 In many cases, Power Pusher’s battery-powered cart can replace a forklift, Blesi says.